April in Malaysia… just after the opening of the full mango season. What varieties are available? Our trip to Malaysia, on this occasion, was brief. 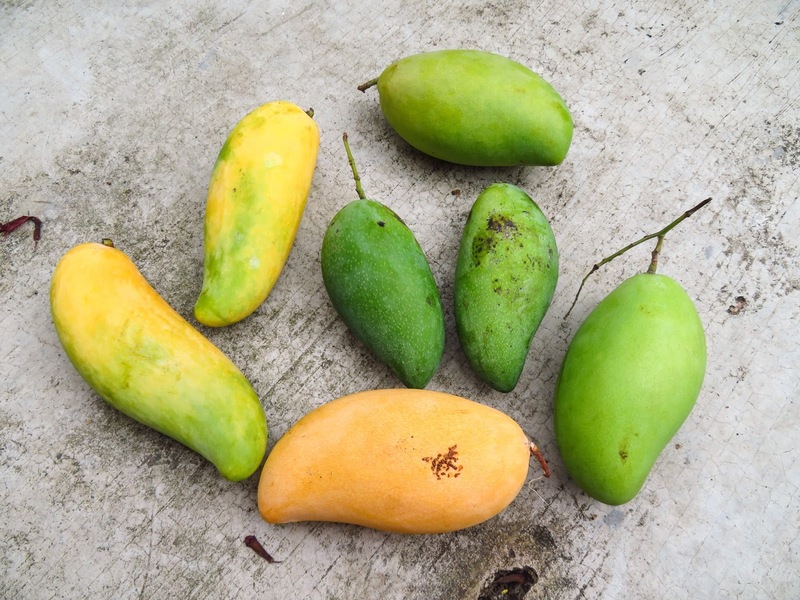 Limited to two destinations, we did not experience the full range of available mangoes. However, there were enough tasty varieties on offer to have an enjoyable and tasty time. 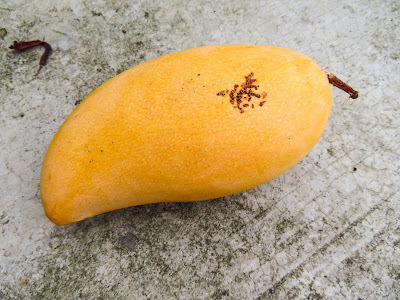 A gold-skinned variety of Thailand's Nam Dok Mai mango. Its name is Lily, a semi-translation of the Thai name (Water Lily). We purchased this tasty specimen in Ipoh, but they were plentiful in Klang as well. Mangga Susu (Milk Mango), a popular mango, appears to have a long fruiting season. These (pictured) are not fully ripe, and have a pale yellow-coloured flesh when ripe. These were also widely available. 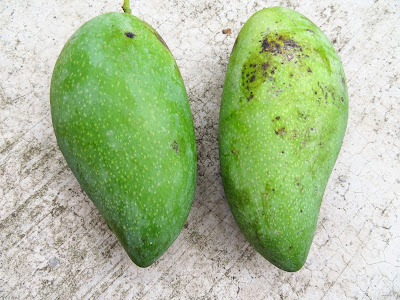 Originally, a Thai variety Black Gold mango (Mangga Mas Hitam) is also very common. It has a satisfactory flavour. 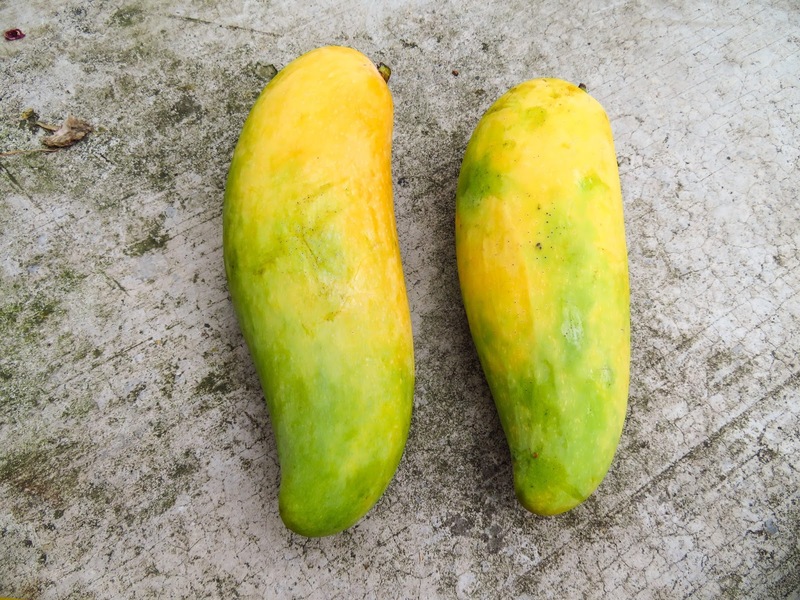 However, there are other superior mangoes available at this stage of the season. It takes its English and Malaysian names from the dark green skin (black) and the golden, almost orange, flesh (gold) These were purchased at a night market in Klang. Like Mangga Susu, Mangga Lemak Manis, appears to have a long fruiting season. 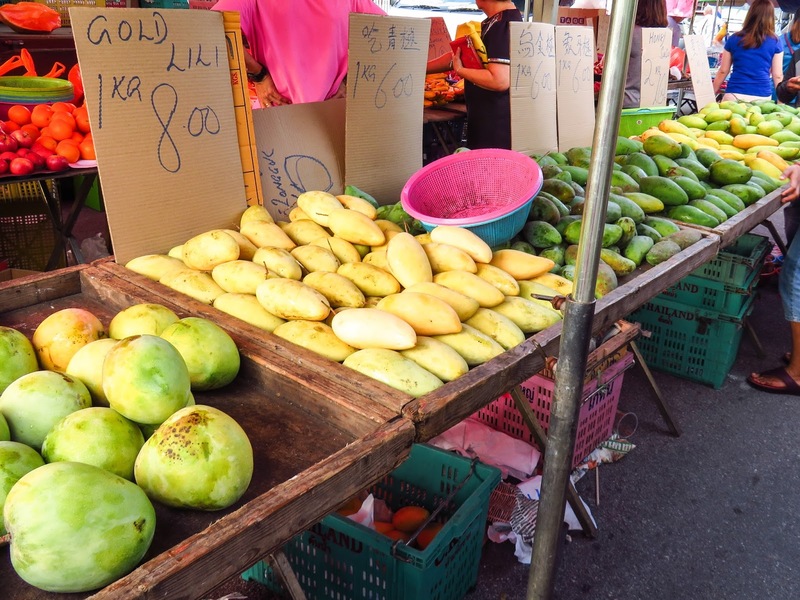 Originally, a Thai variety, Lemak Manis has become more widespread in Malaysia in recent years. One of our favourite varieties, it has dark green skin and primrose-yellow flesh when fully ripe. It is very sweet. 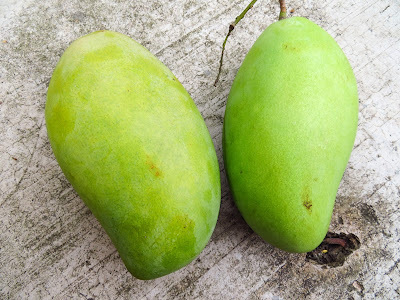 Even when crunchy and green, it is a very tasty mango. These specimens are not fully ripe, and at this stage, can be rather sour. 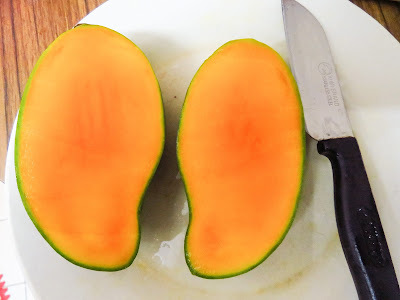 However, when allowed to fully ripen, Rainbow is a delightful mango: its juicy flesh has a buttery, melt-in-your-mouth texture. Its name is derived from its ripe colouration: predominantly yellow, with a pinkish red blush on the sun-facing shoulder. These fruit had been imported from its origin in Thailand, where it is known as Maha Chanok. In fact, if there is a stall of ripe Rainbow mangoes at a Malaysian or Thai market, you are likely to smell them before you see them: they have the most magnificent aroma.